Updated 12:30 p.m. ET | Faisal Shahzad, the Pakistani-born man who confessed to trying to blow up a car bomb in Times Square in May, was sentenced Tuesday to a mandatory life term in prison. 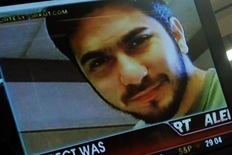 Shahzad, 31, defended his attempt to kill Americans and sparred with U.S. District Judge Miriam Goldman Cedarbaum, who said her sentence was very important “to protect the public from further crimes of this defendant and others who would seek to follow him,” The Associated Press reported. In a surprise move Tuesday, Japan’s central bank cut its key interest rate to virtually zero and is looking to set up a $60 billion fund to buy government bonds and other assets as it tries to inject life into a faltering economy. “As the U.S. economy also flirts with deflation, some economists have warned of a Japan-style deflationary trap that could delay an economic recovery for years….Indeed, the Japanese experience shows that deflation can creep up on an economy and can be difficult to shake,” writes the New York Times’ Hiroko Tabuchi. Police in France have arrested nine people and seized guns and ammunition in anti-terrorism raids in the south of the country, the BBC reports. Police have not said if there is a link between the latest arrests and the warnings to travelers about a plot to attack public targets in Europe.